The unusually wet weather we’ve been having in the St. Louis area is causing my garden to flourish like never before – for now. 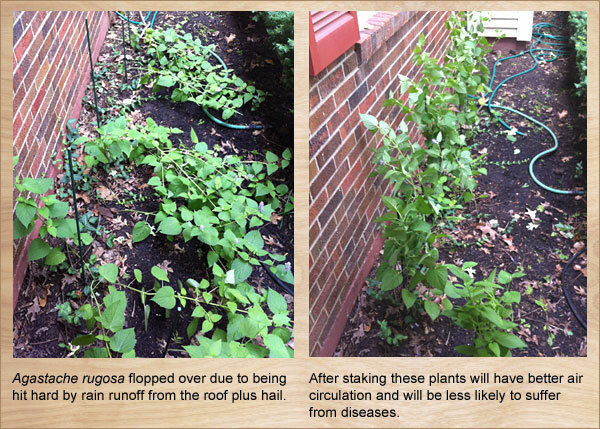 In periods of heavy rain you should check your garden and yard for possible detrimental effects. Here are some things to look for. 1. Check and see if your mulch is washing away. If it is, replace it quickly so that the next rainstorm doesn’t wash your soil away. 2. Make sure plant roots haven’t been exposed. Replace the soil around them if that’s the case. 3. Heavy rains can wash away fertilizer – reapply compost and organic fertilizer. The reason I recommend organic fertilizer is that chemical fertilizer is likely to wash away and harm bodies of water that storm runoff washes into. Also if you are not sure how much fertilizer is needed to make up the loss, plants can’t be harmed as easily by excess organic fertilizer as by excess chemical fertilizer, so there is less chance of problems caused by over-feeding. 4. Do any plants need staking? Since I garden in part shade, it’s not uncommon for some of my plants to lean a bit because they are reaching for more sun, but some are leaning far too much due to being beaten down by storms and need some help. Stakes are not the most attractive things but green stakes and green twine, available at Schnarr’s, help the appearance considerably. Organic fertilizers build stronger plants, according the article “Benefits of Organic Fertilizers: An Overview” on the Dave’s Garden web site, so that is one way to prevent having to do so much staking in the future. 5. Wet weather plus a crowded garden is a recipe for possible fungus problems on your plants. Inspect your plants for signs of fungus and treat the problem if you have to. You might consider thinning plants out or moving container plants farther apart until things dry a bit to facilitate air circulation. Wet weather is kind to transplants, so if you want to do some thinning and start a new bed with the excess plants or give them away to a gardening friend, wet times could be a good opportunity. 6. Is your mulch becoming a growing medium for mushrooms and other fungi? Since I use a lot of wood chip mulch, I frequently encounter interesting fungal growths in my garden and with wet weather we are likely to see more than usual. When I see one, I try to find out what it is before I decide if it needs to be controlled. My favorite mycology reference site is Tom Volk’s Fungi. If the fungus doesn’t need to be controlled, my usual practice is to leave it alone since I find the variety of fungi fascinating and beautiful. If you have pets or children, health concerns, or a fungus that is harmful to plants, you may decide control is necessary. While I’m a fan of eating wild foods if I am sure of what it is, I have never eaten a mushroom from my garden no matter how delicious it looks. I am not a mycologist or skilled forager – I recommend only harvesting mushrooms or any wild foods with expert help since the consequences of making a mistake can be catastrophic. 7. Are any spots in your yard becoming a breeding ground for mosquitoes? Check saucers, bird baths, containers, wheelbarrows and anything in your yard that can collect water. You can dump the water, treat it with a mosquito dunk, add a bubbler (mosquitoes prefer still water) or add fish to eat the larvae if that’s feasible. Bats and dragonflies are excellent mosquito predators. Making your yard more hospitable to those species is a great way to increase mosquito defense. 8. Do you see any drainage problems in your yard? Heavy rain can reveal opportunities to improve how water flows across your property. Since I live in a condo, I only have the ability to address small-scale issues – if you have a large-scale problem come into Schnarr’s to talk to our knowledgeable staff. If we can’t address the problem we can recommend an expert to consult. 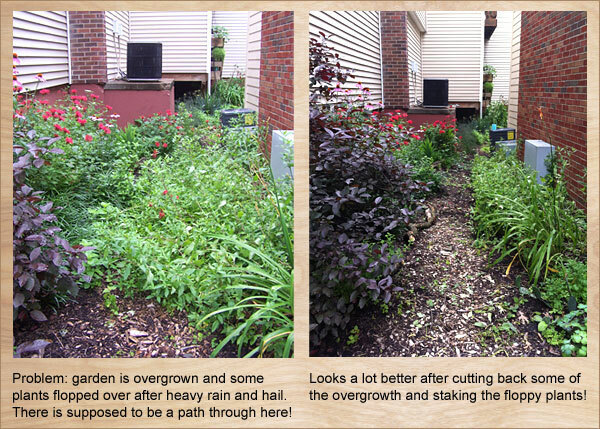 Small-scale problems in my own garden usually consist of spots where excess erosion happens or water tends to puddle due to how rainfall drains off my building. If you are interested in adding a butterfly puddling area, bog garden, rain garden or water feature to your yard, a spot that already collects water is a great place to consider building it. Most of those options are not available to me because of where I live, so I like to control erosion and puddling by digging small trenches to interrupt the water flow and filling them in with lava rock. You can use any kind of gravel for this, but I like lava rock because it fertilizes the soil as it breaks down and the porous nature of the rock provides some natural water filtering capacity. I can extend the trenches to reach areas that I want to get more water and if I cover them up with mulch or plant over them the appearance is harmonious with the rest of the garden. One puddling problem I had a few years ago was caused by a leak in my soaker hose. The resulting puddle was threatening my neighbor’s air conditioner so I fixed the issue with a gravel filled-trench – that was a quicker solution than digging up the whole hose out of the trench it was in and it bought me time to address the leaking soaker hose later. Be sure to consult the Missouri One Call system before doing any digging! I don’t know if a rain chain is particularly functional, but if it adds to your enjoyment of the rainfall why not make one? 9. If water is puddling around plants and those plants are not of a type that can tolerate such conditions, you can create holes around them with a garden fork to help the water drain away so the roots don’t rot. If you have a problem area that needs a long-term solution and you don’t want some kind of water-loving garden feature there, you can try moving the plants and building a raised bed in the spot. Fill it with soil that contains a lot of organic matter and soil amendments that facilitate drainage, such as sand or ground up lava rock. Apply organic matter to the surface as well – that will attract earthworms whose burrows will help the water drain. See how much water your new bed tends to accumulate then plant appropriately. The Missouri Botanical Garden plant finder is a great tool for helping to find appropriate plants for special conditions. and yard, observe the effects of rain and see if you get any good ideas!